VOZ CYCLE City is an independently and locally owned motorcycle shop. We are local riders that understand the wants and needs of the local motorcycle community. We buy & sell motorcycles and we have a consignment program for anyone that has a bike to sell. We also service and customize all makes and models of motorcycles. We have a full showroom with parts, apparel and tons of specialty items to satisfy the ultimate motorcycle enthusiast. We are a dealer for many brands such as Drag Specialties, Parts Unlimited, Bikers Choice, Tucker Rocky, Western Power Sports, Kuryakyn, Performace Machine, Bully Brand, Progressive Suspension, Xtreme Machine and numerous others. The owners, Terry & Carol Vosburgh, are avid motorcycle enthusiasts. They opened VOZ CYCLE City in October 2005 in their first location and moved to their current location 5 years later in 2010. Our crew is customer service oriented and is very meticulous with everything they do. We couldn't be more proud of their work and continued efforts over the years. If you need any repairs done to your current motorcycle, need to pick up some odds and ends for an upcoming trip, want to pimp out your ride, or are in market for a new bike, we encourage you to stop in and check us out. We guarantee that we have something here for everyone and if there is something you want that we don't have, we can get it, so just ask. 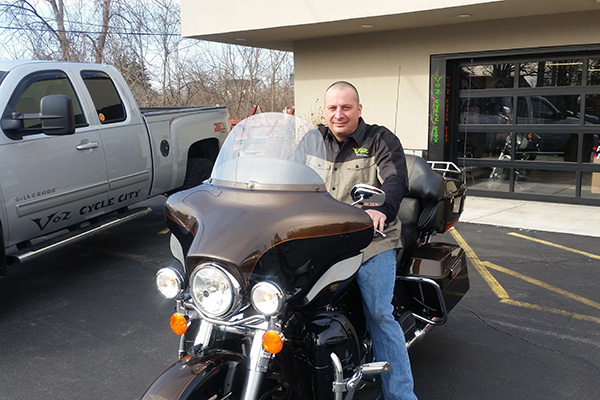 We look forward to serving you and all of your motorcycle needs!